Perspective, as an artist’s tool, has had it a bit rough. At times it can look a bit… complicated. There’s a lot of misinformation out there, especially online. Some books barely scrape the surface, while others can unnecessarily complicate matters. Even computers are adding to the problem. Some recent software applications have hyped up their ability to create images in perspective, without going into much detail about their limitations or own inherent learning curve. Luckily, one thing remains constant. When all is said and done, perspective is really about drawing. If you’re wondering how learning perspective can help you reach your goals as an artist, click on the links below to find out more. What exactly does perspective do? Perspective is great at helping you draw the things that you don’t quite know how to draw yet. While you can seek always seek out reference material, it’s always hard to find the exact image you need. Once you learn to how draw in perspective, you won’t have to be a slave to your reference or compromise your ideas. You’ll finally able to use reference the way you’re supposed to – as visual inspiration and support to help you with your own ideas. Will learning perspective help me with my drawing ability? Definitely. This happens in two ways. First, knowing perspective makes it a lot easier to draw things from your imagination. Perspective is designed to help you correctly show form and space from a particular point of view. It guides your drawing in a way that mimics how the human eye sees. Second, the more you work in perspective, the more you develop a solid visual vocabulary. You’ll have a better sense of what things actually look like, whether they’re big or small, round or square, near or far, even simple or complicated. As your visual vocabulary grows, you’ll find that you’ll need the technical parts of perspective less and less. It’s always there though, to help you tackle the things that are a bit beyond your abilities. Perspective looks complicated – is it easy to understand? Perspective usually looks complicated to people who are either brand new to the material or to those who skipped over the ideas that explain what it does and how it works. Once you go through some basic concepts and define some simple vocabulary, setting things up in perspective will make a lot of sense. One of the benefits of working this way is that once things are set up (about a three-minute process) your drawings will practically be on autopilot – you'll have a constant guide to help you accurately show dimension and space. 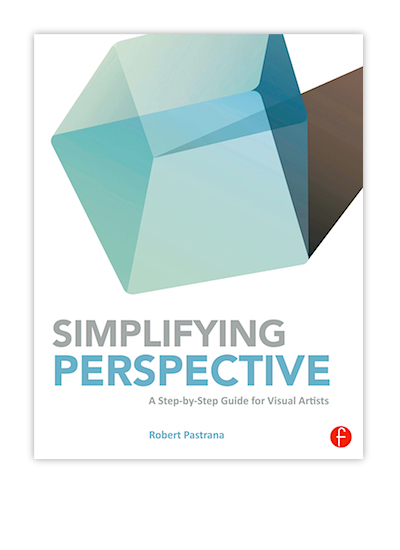 The first few chapters of the book fully explain how perspective works and show you how to set your drawing up for perspective. Since these ideas are so important, you'll find a few short videos that go over this material in a no-nonsense, abbreviated way in the tutorials and downloads section of this website. Drawing in perspective seems very technical – won’t it sap the life out of my work? This question raises two points – first, many people expect the work that’s done in perspective to be a part of the finished drawing. It’s just one step (though a very important one) in the process of making a realistic image. If you’re working smart, you’ll probably be doing these things in this order: coming up with ideas, making sketches (for basic composition), setting things up in perspective, creating a detailed line drawing (based on the perspective drawing), value studies (deciding on your lights and darks), and color studies (based on your value studies). Making these important decisions will help you figure out exactly what you want your final image to look like, and this makes executing your work as easy as it will ever get. Since having a clear and effective workflow is so important, you’ll find these ideas discussed in greater detail in the very first chapter. Second, you may be surprised to find out that a lot of the ideas in perspective aren’t actually technical at all. Once you learn the basics, much of what perspective has to offer translates well when you’re sketching. I specifically made a short three-minute video showing one of these ideas in action. Would you like to know how with just a few of lines you can figure out the height of almost anything that you’re drawing? To learn how this is done, click here. I already know some perspective – does the ‘Simplifying Perspective’ book go beyond the basics? Absolutely. While other books tend to stop at the basics, this one keeps going. For instance, you’ll find about 20 pages devoted to drawing circles and ellipses, 18 pages on how to draw accurate reflections, 32 pages on casting different kinds of shadows, and 20 pages detailing how things are drawn in three-point perspective. You can find the full table of contents here. Do you want a step-by-step guide that will help you cast the shadow of a floating object in any kind of light? Check. What about drawing the shadow of a cylinder or sphere? Check. Drawing vertical and horizontal reflections? Check. Would you like to learn how to correctly reflect an object hovering over a horizontal surface? Check again. How about drawing intersecting slopes in perspective? Another check. Would you like to know how to properly set up a drawing in three-point perspective? With a measuring system and/or grid? Check, check and check again. There are a lot of perspective books out there – how is this one different? This book is different from most others in a couple of ways. First of all, it’s in full color. This makes it a lot easier to clearly represent each element in a drawing or diagram. Second, every technique is laid out in a clear step-by-step way, with each step shown and explained as you go. Each step highlights the task at hand with stronger, more pronounced colors and fades back the elements from the previous steps. This makes it easier to focus on the relevant information at hand. Because you have easy to understand diagrams that are explained as you go, you’re better able to learn the material faster. Each chapter starts out with a general explanation of how the particular topic works and what it does. Relevant vocabulary is explained and shown. The rest of the chapter is devoted to showing, in step-by-step form, the various ways of tackling the problems that the chapter is devoted to. Since a picture is worth a thousand words, a chapter excerpt is included on this website. Click here to see a sample from Chapter 12 - Casting Shadows. Why do I even need to know perspective – can’t software do that? This is becoming a very common question. While there’s software that can make quick work of some common repetitive tasks, 3D software isn’t a very user friendly when you’re trying to work out some rough, general ideas in perspective. You’re better off using software as an ‘execution’ tool rather than an ‘ideation’ tool. If you’re new to both 3D and perspective, you’ll find the learning curve is much smaller with perspective. Every time you work something out with a pencil or stylus, you give yourself the opportunity to get better at drawing. That’s always a good thing. Chances are, the digital artists you admire the most are probably also pretty good with a pencil. A good part of that has to do with having a command of form and space – the two areas where perspective helps you the most.